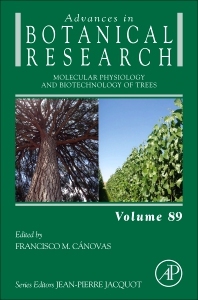 Molecular Physiology and Biotechnology of Trees, Volume 89 in the Advances in Botanical Research series, highlights new advances in the field, with this new volume presenting interesting chapters on such topics as the Activity of the shoot apical and cambial meristems: Coordination and responses to environmental signals, Conifer functional genomics, Nitrogen storage and cycling, Tree defense against pests and pathogens, The ectomycorrhizal contribution to tree nutrition, Phytoremediation with trees, Transcriptional regulation of wood formation, Transgenic poplars, the Genomics of forest trees, and much more. Francisco M Cánovas is a Professor of Biochemistry and Molecular Biology at Málaga University where he has been responsible of the Research Facilities and the Functional Genomics Unit. At the present time he is the head of the Molecular Biology Laboratory, coordinator of the PhD program in Molecular and Cellular Biology, and Director of a research group in Plant Molecular Biology and Biotechnology. His research interests are related to the Biochemistry, Molecular Biology, Genomics and Biotechnology of nitrogen metabolism.